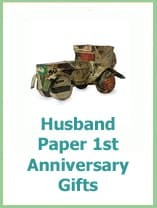 1st wedding anniversary gifts are traditionally made of paper. And if you are thinking, paper! Really? What kind of gift is that? 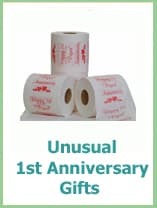 Then you are about to be pleasantly surprised, as there are lots of unique paper gifts. 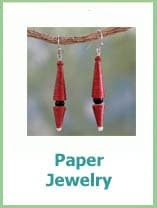 For some, paper represents the fragility of love and how it is easy to break and in some cases thrown away. It is our reminder that love needs looking after. For others, paper is the first step and as the years pass and your love grows your anniversary gifts grow too. 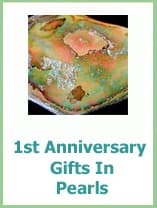 Here are lots of one year anniversary gifts they will treasure, plus we have lots more available to buy. These stylish engraved cufflinks hide your own special 1st Anniversary message written by you for your Husband. Super secret and super cute. 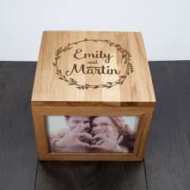 This Personalized Photo Cube has both of your names engraved on the top and there is space inside to store their favorite candy. 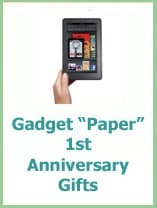 Add your own favorite photos of the two of you and it will match the traditional 1st anniversary theme of paper. Have fun together with this jigsaw puzzle of the front page of the Washington Post from your wedding day. You could frame it after you have completed it. 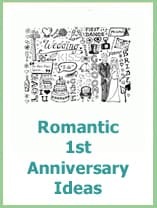 A very unique 1st Anniversary book which is personalized with your names and Wedding date. Inside there is a copy of the newspaper from your Wedding Day and then lots of space to add your memories from your first married year. 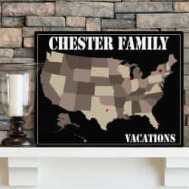 This Personalized Jigsaw Puzzle is a map of where you first met, with a heart shaped piece to mark the exact spot. When you have finished the puzzle it makes a great piece of Art for your Wall. 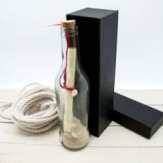 Send your 1st Anniversary message in a glass bottle. 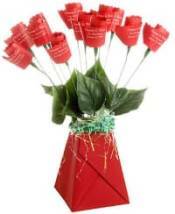 We will print your message and send it to your love for you. You could even send it out to sea! 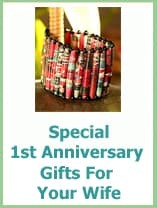 We have a number of beautiful Jewelry Gifts that come in their own personalized gift box which fits the first year anniversary theme very well. 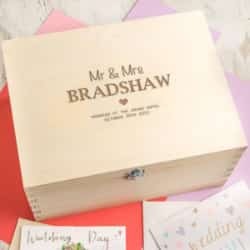 On your 1st Anniversary you may want to start an Anniversary memory box, where each year you fill it with precious memories from the past year. 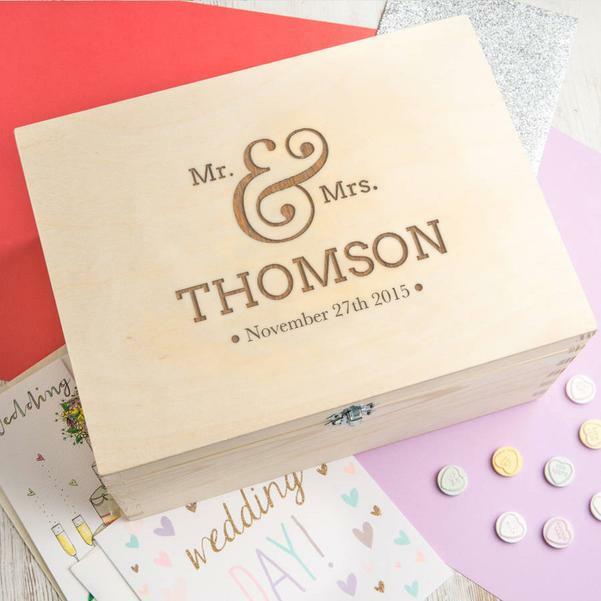 Our Memory Boxes are personalized with your names and dates and are available to buy in store. 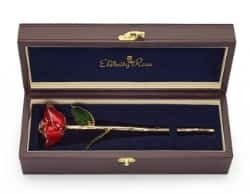 A rose that will last forever and dipped in Gold to be treasured. 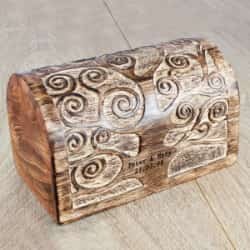 Collect your memories in this gorgeous Treasure Box. 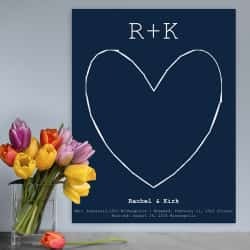 Personalized with your names and your Wedding Date. 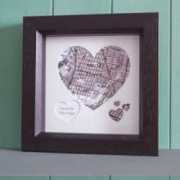 You very own wall art with a heart shaped map of your favorite place and personalized with your own 1st Anniversary message. 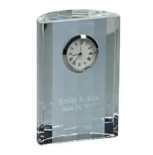 A very smart Crystal Anniversary Clock which can be engraved with your names and your Wedding Date. 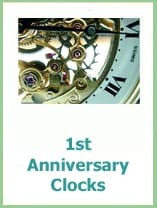 Clocks are the modern gift for your first Anniversary and this clock will be very unique to the two of you. Choose to either have a map or a satellite photo of your favorite place. It could be where you met, were engaged, married, your home or where you love to go. You get to choose. We have his and her watches that will show you how time flies when you are having fun. 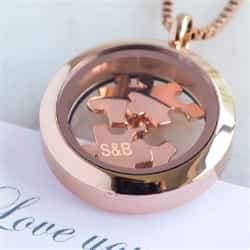 Engraved on the back with your own message of love. Your love story on canvas is a very stylish and modern piece of art. 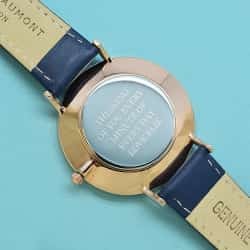 A choice of colors and personalized with your important dates and names. Plan your lifetime of vacations and show where you have already been together. 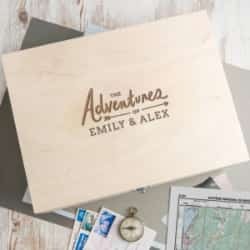 A great gift for a couple that loves to travel. 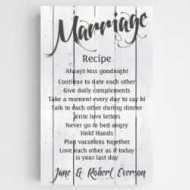 Your recipe for a Happy Marriage and personalized with your names. A real talking point at home too! Your first year as husband and wife is one that you will remember forever; all the places you have been and the fun you have enjoyed are the foundations of your story. 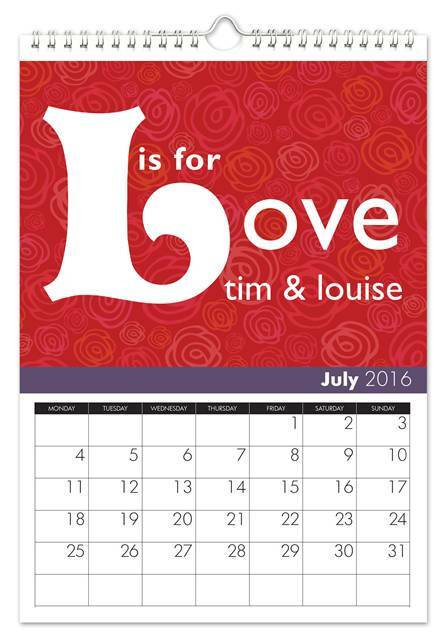 Your very own Anniversary Calendar would be a sweet 1st Anniversary Gift. And your very own Anniversary message. 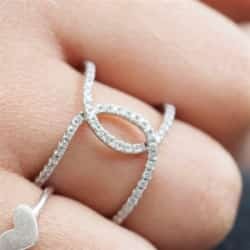 1 year wedding anniversary gift ideas for your wife need to be romantic and made from paper or clocks if you are following the traditional or modern lists. You could even send her a paper rose or a paper kite for you both to go and fly. Add a picnic on paper plates and you have a full paper day out! 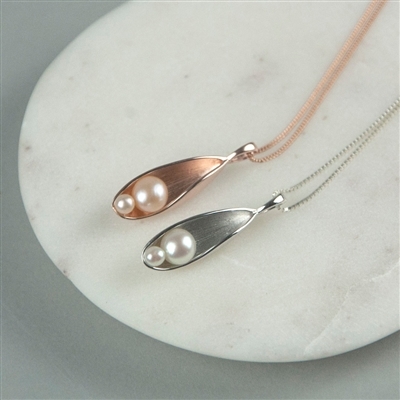 If you are thinking of being more extravagant then on the gemstone anniversary list you can celebrate with pearls. 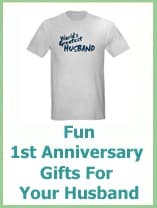 1st anniversary gifts for husbands need some creativity! You will probably need to let them know that the theme is either clocks or paper, otherwise some of your gift choices may seem a little odd! 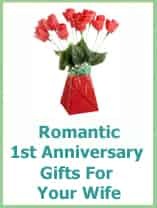 We have even put together some fun gifts for those that are more practical than romantic! 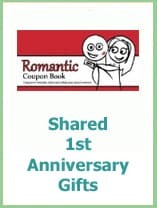 When it comes to your 1st anniversary the easiest gift has to be a card! If you make it yourself you can personalize it with a romantic poem or even a wedding photograph of you both. If you are the creative type a simple origami creation (the art of folding paper) would be a sweet keepsake, paper folding a heart is a fairly easy one. 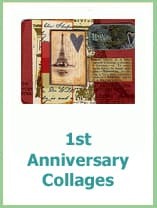 Another idea is to make a collage of all the fun times you have had together over the past year. If you keep tickets or programs of things and places you have been to together and photographs you can stick them all together and frame them. You could paint a picture or photograph your favorite place and then frame it as a lasting memory of special times that you have shared there. For those less creative but romantic you can frame your first emails! Or have them printed in a photobook along with photos of the two of you from the time. It would be your very own love story. 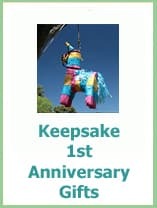 Together you could create an anniversary memory book and fill it each year with photographs and souvenirs from the day. You can buy newspapers from past dates, the headlines from the day that you got married will be fun to look at in the future. 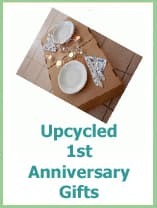 Talking of newspapers which fit nicely into the paper theme why not take out a personal ad announcing that you wish your partner a very happy first anniversary! Minimal cost but nice and romantic. For those that love to read you can buy a book by their favourite author, or a special first edition. 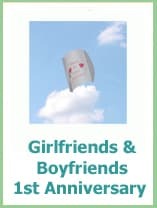 If you are splashing out on a big gift then how about a subtle paper gift in the form of tickets. This could be for a show or even plane tickets and to complete the theme you could have a book on where you are going as their first gift. I would have the camera and tissues ready for when they open that one. 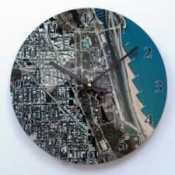 If you are looking to celebrate with a more modern gift, then the modern list has clocks for your first. 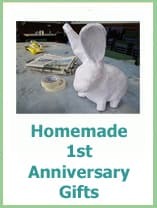 If you prefer to do something together on your 1st anniversary then how about an experience day? And they are not all thrill seeking, you could be pampered on a spa break, or enjoy a gourmet meal or a show. 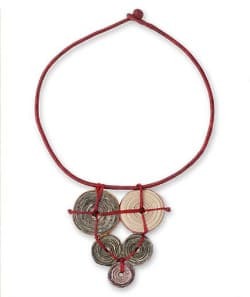 The beauty of this gift is that it will come in the form of paper with tickets! Have fun planning your day!